Pilates Spine Exercises for a Healthy Back! Pilates spine exercises using the spine corrector helps to balance the spine and improve your posture by moving the spine in all ranges including flexion, extension, rotation, and side bending. When you are flexible in all ranges that the spine moves and, you have core body strength to help support the spine in an upright position then you will look and feel young and healthy. 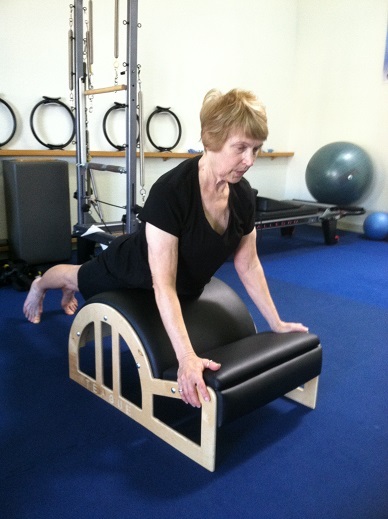 Using the Pilates spine corrector to balance the spine and body is what Joe Pilates had in mind when he developed it. What he was trying to tell us almost 100 years ago was that if your spine is old and frail and inflexible and hunched over then "You" will look and feel old as well. 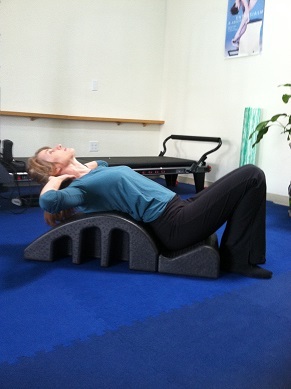 Pilates spine exercises on the spine corrector include some of the following. Sitting in the grove of the barrel reach your arms forward and begin rolling back into the barrel with your waist, then ribs, then shoulder blades. Inhale to stay there and feel the extension in the spine, and then exhale to begin rolling forward, head first, then ribs and waist off. Repeat this Pilates spine exercise for 4-6 repetitions. Inhale to sit tall on side of barrel as shown with arms extended, then exhale as you slowly bend or peel yourself over the barrel sideways. Top arm reaches up and over head. Inhale to lift bottom ribs and chest up off the barrel and exhale to come all the way back up reaching to ceiling with bottom arm to finish. Repeat for 4-6 repetitions on each side. Add a rotation to this one as you start bending over roll towards the barrel to face it. Balanced on top of the Pilates barrel with your pelvis face down, inhale to push up with your hands into extension like a cobra pose. Exhale as you lengthen yourself out over the barrel reaching your chest long and away. Inhale to press up and exhale to rock down. 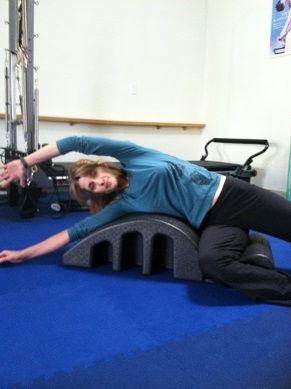 You will feel like a rocking chair or teeter totter with your hip bones as the center or fulcrum. Keep your belly button drawn up and into your spine. Repeat rocking for 4-6 repetitions. 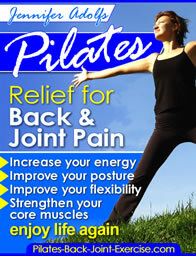 Find out more about Pilates spine exercises and how to achieve a healthy spine from this page.